← Plant City, Florida. December 25th, 2011. Some areas of Christchurch may be rezoned as red following two large earthquakes and a steady stream of aftershocks. A magnitude 5.8 followed by a 6.0 earthquake struck off the coast of Lyttelton on Friday afternoon, causing liquefaction to once again erupt from the earth and leaving sewerage, water and power out of action in pockets of eastern Christchurch. A series of “intense” aftershocks have followed, and “hundreds and hundreds” were recorded by GNS in the 24 hours following the two major quakes, said seismologist Bill Fry. Christchurch mayor Bob Parker said the eastern suburb Parklands, one of the worst hit by the shakes, could be one of a few left too damaged to live in. He told Radio New Zealand the Canterbury Earthquake Recovery Authority (CERA) would reassess areas which could need to be rezoned. He said Parklands, straining under piles of liquefactions, could be re zoned as red if the engineers deemed it too damaged. There was a genuine need to re-evaluate around the edges of the decisions on zoning, which had been “pretty much right” so far. Aftershocks have continued over the weekend, some reaching over magnitude 4. By 9am today, the GNS website showed six aftershocks since midnight ranging from magnitude 2.9 to 4.1. 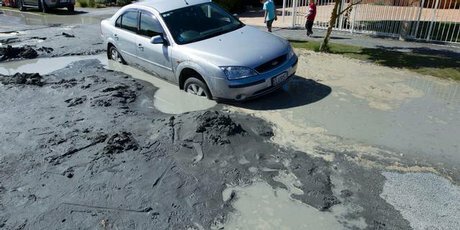 This entry was posted in Pictures, Vehicle v Sinkhole and tagged Christchurch, New Zealand, sinkhole, sinkhole v car. Bookmark the permalink.